Wix Review 2019 | Discover All The Features & Advantages! We made every effort to ensure that this review was accurate and fair, but we’re only human. If you think we’ve got something wrong, or that the review does not reflect your own experiences with the product, we’d love to hear from you. Leave a comment below, send us an service@ top5-websitebuilders.com, or write your own review in the Customer Reviews section. Wix is one of the most popular website builders today, and it’s not a surprise when you see the impressive site building capabilities and the beautiful templates that you can choose from. The company was founded in 2006, so they’ve been around for a while, starting out with flash templates and moving on to the more efficient and adaptable HTML5. Wix’s extremely useful freemium business model allows you to get to grips with the platform’s functionality before upgrading to a paid subscription. The Free Plan gives you access to the complete platform with all the templates. You can launch a site without spending a cent, but you’ll be restricted to a subdomain, and you won’t be able to remove the Wix ads from your site. 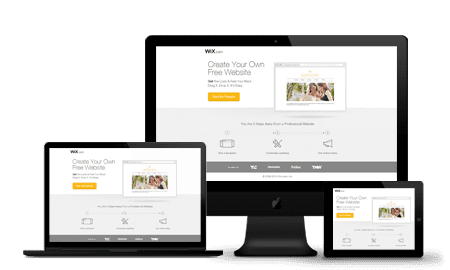 Bandwidth and storage are also limited but overall, there’s no better way to discover if Wix is the website builder for you. This plan is $8.50/month, and includes 2 GB bandwidth, 3 GB storage, allows you to connect your domain, have a free domain, remove Wix ads, have a customized favicon and receive $75 ad vouchers. This plan is $12.50/month and includes unlimited bandwidth, 10 GB storage, allows you to connect your domain, gives you a free domain, remove Wix ads, have a customized favicon, receive $75 ad vouchers, receive a Visitor Analytics App (worth $608) as well as a Site Booster App (worth $60). This plan is $24.50/month, and includes unlimited bandwidth, 20 GB storage, allows you to connect your domain, gives you a free domain, remove Wix ads, have a customized favicon, receive $75 ad vouchers, receive a Visitor Analytics App (worth $60) as well as a Site Booster App (worth $60) and gives you an amazing online store, gives you 10 email campaigns per month as well as a professional site review. You’ll also enjoy a Professional Logo ($60 value), priority response, VIP support, and other benefits. This plan is $17/month and includes unlimited bandwidth, 20 GB storage, allows you to connect your domain, gives you a free domain, remove Wix ads, have a customized favicon, receive a Visitor Analytics Builder App (worth $60) as well as a Site Booster App (worth $60) and gives you an amazing online store. Additionally, you can post 5 video hours, accept online payments, and it is 100% commission-free! The Business Unlimited plan is the most popular of the business and ecommerce plans. For $25 per month, this plan gives you 35 GB storage, unlimited bandwidth, free domain, 10 video hours, social media logo files, and Google Analytics. You’ll enjoy a professional logo ($50 value), Site Booster App ($60 value), and Visitor Analytics App ($60 value). Of course, you can accept online payments and it is 100% commission-free. The Business VIP plan costs $35 per month. In addition to everything you get with the Business Unlimited plan, you also get 50 GB of storage, unlimited video hours, priority response, and VIP support. All of the Wix templates are optimized for mobile, but they are not responsive. This means that after you’ve finished working on your website, you will have to work on your mobile site separately to make sure that everything looks good. It is very easy to do but does require additional time and effort which could have been avoided if the templates were 100% responsive. To edit your mobile site, you simply switch to the mobile editor and you’ll be able to see what your website looks like on a mobile phone. You can edit the mobile site with the same flexibility and control as the regular site builder, and choose different items you’d like to show or hide when your site is viewed on a smartphone. As of April 2019, Wix has released exciting new mobile design features. Now, just for mobile, you can create a branded welcome screen to showcase your personal brand. You can also offer a custom mobile menu and add lively animations that are designed especially for the mobile experience. You’ll have fun playing with the new mobile layout for gallery images as well as adding image animations and hover effects that will catch your site visitors’ eyes. Search engine optimization is important, and Wix has quite a lot of SEO features. Basic SEO features are available in the Wix SEO Wiz in the website settings. In addition, you have the App Market. Because Wix has a market where you can search for and add apps, you can add many SEO and marketing apps that will help you promote your website in search engines and market it to your target audience. Some apps are available for free while others have premium features that require a one-time fee or subscription. Setting up a store on Wix is pretty fast. You simply click Add and then Store. In order for it to work, you need to upgrade to the eCommerce package. Once you do, you’ll be able to easily add and edit products, edit how the store looks visually, and the different payment options. Stores on Wix look very modern and are similar to most popular fashion sites today so all you have to do is add your products and configure the store settings in order to have a great-looking shop. Wix has an App Market where you can browse loads of different apps by partner companies and even Wix. You can browse apps by category or search for a specific app or feature that you want. Some apps are free, while others have additional premium features that require a fee. Many of the available apps are quite useful, like the MailChimp app for collecting subscribers, or the Facebook Like Popup that engages your visitors with a popup and asks them to like you on Facebook. Wix has quite a lot of templates to choose from and they are all divided into many different categories, which is a good thing because browsing all of them would take a few hours. You can browse the most popular or new templates, or you can start from scratch. Wix provides its users with pretty comprehensive support. If you visit the Knowledge Center, you can browse and search discussion boards and tutorials to find the answers you’re looking for. If you need help just understanding the site builder and how to use its different features, check out their Training Videos. You can also look through their FAQs or open a ticket in the Help Center if you still need assistance. There is no option to contact them directly via chat, phone, or email, but if you open a ticket, you’ll get a response from someone at Wix fairly quickly (a few hours) and they are very helpful and eager to solve your problem. Wix is especially suitable for designers with or without a technical background. This is because no technical experience is required, but you also have the option to use advanced code capabilities if you choose. The design capability is unlimited – the downside to this is that someone without any design skills may find it hard to customize their website due to too much flexibility. The Wix site builder is extremely intuitive and easy to use and even includes the standard “CTRL+Z” to undo recent actions. With Wix, you simply click an item and drag it anywhere on the screen. You can also double-click items to edit them or hover over them to see menu buttons that you can click for customization options. Each website is divided into different sections. The header and footer can be seen on all pages, and anything you drag there will also be visible on every page. You can drag the footer or header borderline in order to make them smaller or bigger. If you move something outside of the content area, you’ll be notified, so don’t worry about that. Because of the complete control when dragging items, it may be hard to align items exactly in the middle or next to each other. Make sure to pay attention to the gridlines that appear when an item you’re dragging is aligned with something. The flexibility that Wix allows over individual design elements is great. Because you cannot transfer your website to a new template once you start building, it’s important to take your time in deciding which template is right for you before getting started. There is support at all times on the site, however phone support is only available during certain hours. Wix offers video tutorials on its website. They don't have an actual FAQ page, but they have an Online Help Center which is the go-to place for any and all questions you may have. It is so comprehensive that chances are you’ll find exactly what you came for with just one simple search, and you can enter a question in the search. Wix Forum is available in multiple languages. To contribute to the forum with admin privileges, you must log in to your live site using the email associated with your Wix account. Wix posts regularly about how to market your site, design tips, specific niches and how to create better websites, etc. Wix is an excellent site builder and its popularity is well-earned. For designers, it is like building a website in Photoshop, with complete control over every aspect of the site without complicated technical features. For those who want to code, they’ll have access to advanced code capabilities. The features available are extensive and the App Market makes it easy to find creative features like popups and forms that you can add to create a really professional-looking and functional site. If you follow the site templates, you’ll be sure to turn out with a stunning website. About choosing a template: Can you change the template while building the site? With Wix, you can always choose a new template but note that you'll have to start building your site from scratch. Does Wix support affiliate marketing/Amazon blocks? Yes, Wix does support affiliate marketing, including via Amazon. I have a small business- barbershop- and want to know if you have anything geared towards that field. Yes, Wix has several templates specifically for barbershops! Click on the link to Wix in the review, and then once you are on the Wix site, click "Templates." On the left, choose the template category "Fashion & Beauty," and under that, you will find an option to narrow the templates to "Hair & Beauty." You can then choose the template that you prefer for your barbershop. Do you charge a fee after the site is developed and doing well? What are your fees each year? No, Wix does not charge a fee based on your website's performance. There are different packages available at different price points, however, you can continue to use the free version of Wix as well. Prior to committing to the published state and going online, can I just try the uploading of video and/or audio features of my unpublished site before publishing? Yes, you can preview your site before publishing. Do any of your plans include email accounts for employees? Wix plans all include the option to create a personalized business email address for an additional fee that varies depending on how many employees you want to have email addresses for and what type of plan you choose (monthly versus yearly). When you sign up to the premium plan of your choice, simply add "purchase mailbox." I’m looking for a personal blogging platform. Is Wix good for that? Yes, Wix is a great choice for personal blogging. There are more than 50 templates just for blogs, though you can also choose any of our other website templates and opt to add a blog page. I would like to keep Wix, if I can lower my bill. I don’t need all the extras in the package I have now. It is possible to change your Premium Plan to one that better suits your needs and budget. To do so, go to Premium Plans in your Wix account. Select the plan that you want, and click Change plan. Wix offers a free plan, in addition to premium plans that start at $4.50 per month. I’m wanting to make a blog and be able to share the link for friends to view via social media. Can I do that with WiX? Yes, you can absolutely do this with Wix. There are even social media share buttons on each blog post so that you can easily share it on the social media platform of your choice. Alternatively, you could copy and paste the blog link to your social media page. Can Afterpay option be used for customers? Currently, Afterpay is not one of Wix's payment options, however it may be added in the future. Wix offers numerous other payment options, like PayPal, Square, Stripe, Wirecard, 2Checkout, Moolah, Braintree, and more. Can I build a blog for a blind support group? While Wix does not have a specific blog template for blind support groups, they do offer many blog templates that you can easily customize to meet your needs. Your blind readers can use software (a screen reader) to read your blog and can comment. The free Wix Forum app is a great choice to upgrade the interactive experience on your site. There are many tips that exist for building a blog that makes it easier for blind readers to navigate, such as clearly labeling all buttons, using headings in your blog content, and clearly labeling your comment forms. Yes, clients can order products directly from the website. Hi, I have a few questions, Do you have a payment for your services option and a pay per click option? Also is product sales an option and what do you provide for SMB and SMO? You can certainly sell products and services on your Wix website. Your customers can pay directly on the site. Wix offers numerous plans at different price points to suit different people's needs, including three business plans that can be good for SMB and SMO. Regarding PPC, there are a few different ways to set up ads on your Wix site, as well as tracking and analytical tools. Do you have templates for dog grooming businesses? Wix offers a variety of templates for animal care services. For dog grooming, you may like the "Pet Care" template which has a "grooming" page. You can edit the template to further fit your needs. Can I link to a courier app? Wix offers hundreds of apps in their App Market (https://www.wix.com/app-market/category/all-apps). If you are selling products online, you can choose from multiple shipping options such as local pickup, airmail, door-to-door, express mail, and standard shipping. If you simply want to add a link to your Wix website, it is a very simple process done by clicking the hyperlink icon. Do you offer templates for counselling practices? Yes, Wix offers templates for counseling services. Looking for a fundraiser web page. Non profit for a group of kids and their parents to raise funds to go to the Olympics. Wix offers several templates for nonprofits, including for fundraising. Check https://www.wix.com/website/templates/html/community-education/religion-non-profit for ideas. Can I connect my PayPal account and can the sites be built and updated with an iPad? Yes, you can connect a PayPal account to your Wix site. Wix ADI sites can be edited from mobile devices with the Wix Mobile app or Wix on Mobile. If you do not have a Wix ADI site, it cannot be edited on a mobile device/tablet. With the Combo Plan, can I choose my own domain name, and will that cost more? The Wix Combo plan includes free domain name for a year. You would choose your domain name. Do you have templates for a veterans organization? While Wix does not have a specific template just for veteran organizations, they do offer many templates for community organizations and nonprofits in general that you can customize with text and images to match your veteran organization's vision. Hi when using my own domain name can the extension be anything ? like .lk? Wix offers dozens of domain extensions but not .lk, which is the domain extension for Sri Lanka.